In the March 5th edition of LegitMassage.com we highlighted several things to know before your Massage session and briefly touched on the topic of the Client Intake Form. Today, we discuss in more depth the importance of the Intake Form and what information it should contain in order to maximize the effectiveness of the treatment. First, why is the Intake Form important? The Intake provides any necessary information that the therapist may need to know to effectively assess an issue and address with a personalized treatment plan. Because different issues and ailments vary from person to person, treatments will vary as well. What may be an effective treatment plan for one person may not be as effective for another. The Intake Form is the blue print of how to build a healthier structure. The Intake Form provides information to the therapist as to what focus areas to concentrate on. It allows you to take an active role in your own treatment plan and develop a priority of what needs focus. The intake gives the therapist an idea of any contraindications to avoid during the treatment. Many times the intake will reveal any allergies that you may have as well as any accidents or injuries you have suffered in the past that the therapist needs to know about. Like that dislocated shoulder you suffered in 6th grade! Next, what information does the Intake Form need to contain? At the very least, the intake should ask for a brief review of your medical history and include any current medications as that is important for the therapist to know. This includes any accidents, injuries, surgeries, or other medical conditions the therapist needs to know about. Any current issues or ailments should be addressed in the Intake Form. This gives the therapist an idea of what kind of treatment you desire. If you list sore Iliotibial Bands or ITBs on your Intake Form, the therapist will know that you are looking for more than a stress relief/relaxation massage and instead may benefit from deeper tissue work to the hip flexors as well as knee extensors and antagonist knee flexors, etc. Your contact data should be present on the form. This includes a contact phone number and email address. Home address, other phone numbers, and date of birth may be optional information as well. 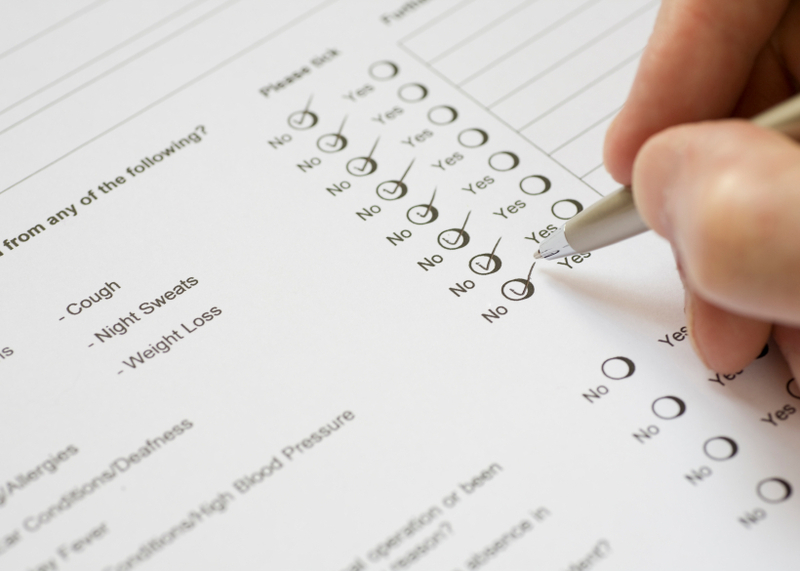 Some Intake Forms include body maps and assessment charts. This enables the therapist to track any trigger points, ranges of motion, chart strengths of muscles and note any tissue characteristics. Maps and charts further increase the effectiveness of the treatment plan. I have sometimes seen longer Intake Forms that provide a detailed check the box list of many different and various pathologies. Others may include an area for the patient to chime in on their own preferences as to what kind of massage they like and any areas to key in on or avoid. Some states require that you sign a confidentiality disclosure as part of the Intake Form. If insurance is accepted, a HIPPA agreement is mandatory and is often filled out at the beginning of treatment. A HIPPA or Health Insurance Portability and Accountability Act of 1996 basically ensure confidentiality and limits who has the right to see healthcare information. Licensed Massage Therapists use the initial interview as the beginning point to a successful treatment plan. The Intake Form is the first bit of information that we learn about you. As the therapeutic relationship develops, we file the form of initial information and build upon it with a subsequent form called a SOAP note to track your progress. A SOAP form contains information that you tell us, information we observe, anything we assess during palpation or treatment, and lists what we did during our session. Hence SOAP, Subjective, Objective, Assessment, Plan. Intake Forms and SOAPs vary as do treatments. A commonality is the process and keystone in helping to render a healthier you. Kip Yates, LMT was trained at the Swedish Institute in New York City and is New York State and Texas State licensed. He is owner and operator of Massage Refresh in New York City where he provides Swedish wellness and recuperative Deep Tissue massage that encompasses myofascial release and trigger point therapy. Kip lives in Brooklyn with his wife and three children and also practices at Physiofitness Physical Therapy in Soho. Hi. I work for a corporate massage franchise and was wondering about the way my clinic practices the use of intake forms. The therapists and front desk salespersons are kept in separate worlds. It is not the responsibility of the therapist to ask clients to fill out an intake form or ask for payment, rescheduling etc…We are told to stick to working with the clients. However, there has been a huge problem with recieving clients who have been told to just sign the bottom of the page and not worry about filling out anything else on the intake icluding medical conditions, desired pressure, or areas of the body that can be worked on. So the massage therapists are faced with having to fill it out for them or watching them fill it out themselves or not even having a completed intake form (which may cause frustration for the client). My question is how should a massage therapist in this setting deal with clients who are not filling out their intake form (and work around the management who does not take constructive criticism)? That’s a good question Joanie. Many massage franchises work this way unfortunately and it is a huge liability. I too found it frustrating that I could not read a completed intake form and instead was told to just ask. I am licensed in New York state and when I asked about the law requiring records to be kept for 6 years I just receieved a shrug of the shoulders. Frustrating I know! However, my suggestion is to keep a notebook of SOAPs on everyone you treat. I would get at least the name and write down any subjective information you are told as well as any objective information that is important. It is also important from a personal liability concern to highlight any techniques you used in treatment. Take the initiative and keep these records private for as long as your licensing authority requires it. I hope information helps you. Thank you Kip! I used to keep a detailed soap-notebook when I worked at an establishment that did not pay me! (Yikes!) But at my new place they pay me so I stopped keeping a soap-notebook. I am comfortable just having the intake forms at the clinic, but I don’t think many people realize the importance of the intake form. I think I’ll just have to play two roles…massage therapist and salesperson in order to get these filled out properly! Thank you for the idea Joanie. It is a shame that the sales staff are treating the intake as inconsequential and the bigger shame is that there is not much in the way of legal ramifications against any establishment not utilizing the intake form. I am glad to hear that you are taking your title as a massage therapist seriously and making sure protocol is followed. I recently got hired at a small massage practice here in california, but they dont intake people at all…? is this aginst the law? Hello Alicia, I am not too certain about California laws but I will chime in that regardless of legal status, not keeping appropriate records about a client and her health history as well as SOAP notes for individual sessions sounds like a bad idea and a potentially hazardous liability. My suggestion is inquire as to the local laws and if intakes are required, bring this to your employer’s attention. If they do not want to comply, then suggest that you will self-comply to protect your license or certification. If they still want to give you guff, then find another place of employment that will not harbor such liability risks.